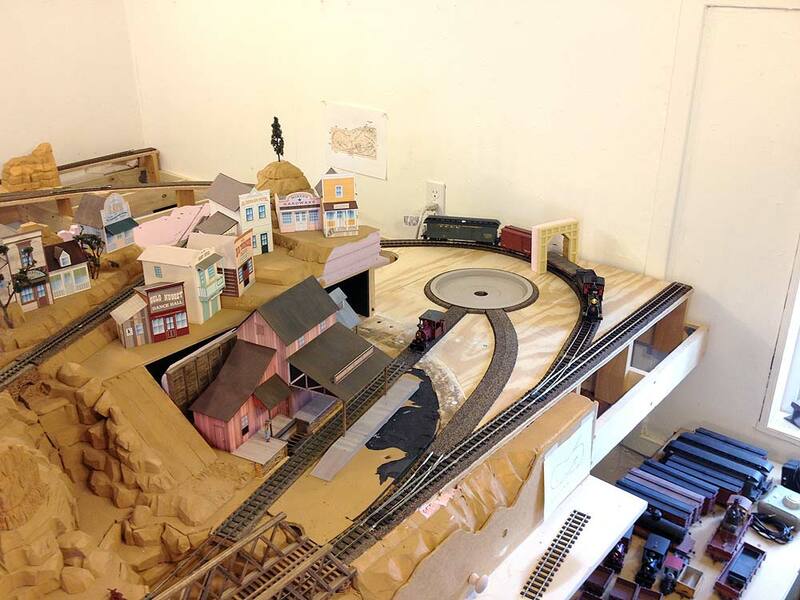 Still no track laid in the new Calico section, but the scenery has been roughed in over Rainbow Caverns and in the new town and turntable areas. The turntable itself has been installed (though still not wired) and a small new section has been added where the just completed Thunder Mesa Depot now sits. The bookshelves have been moved to make way for further expansion of the layout as plans for this area continue to evolve. All in all a pretty productive month on the old railroad. Throughout October I'll be focused more on a few rolling stock projects I'd like to get finished and perhaps a little more scenery building. Thanks for checking in! 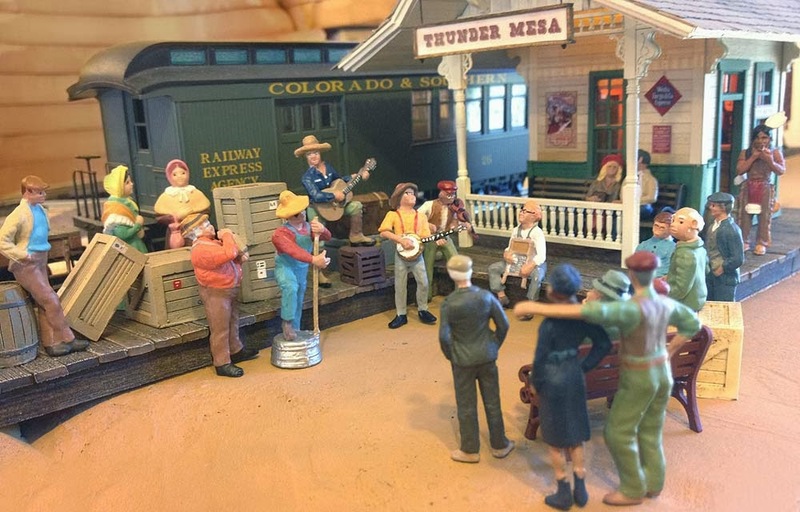 It looks like Billy Hill & The Hillbillies have come down to play and everyone's having a grand time at Thunder Mesa Depot's grand opening celebration! Well, I think I can safely say that Thunder Mesa Depot is now finished. Of course, there are always more details to add and little things to tweak but the project has now reached that point where I'm ready to move on to the next thing. 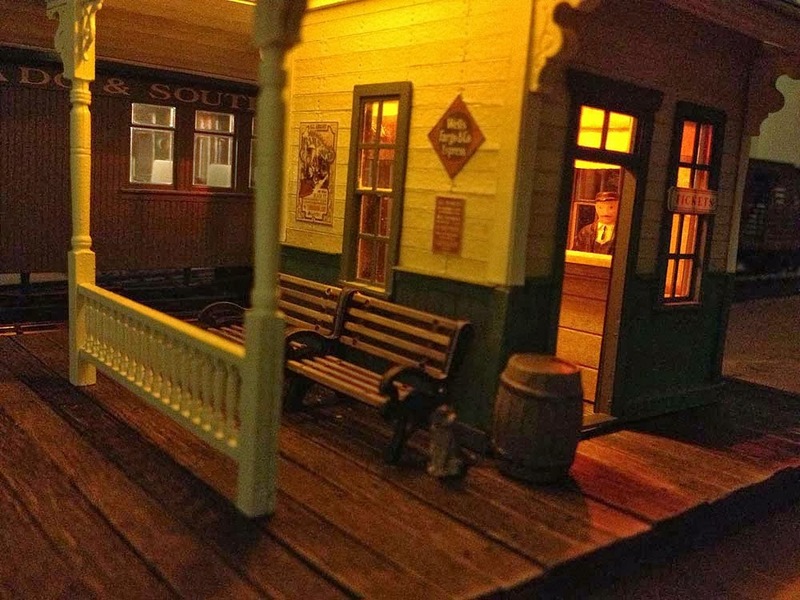 The platform is detailed, the signs are hung, the roof is weathered and the lights are on. Yup, looks finished to me. 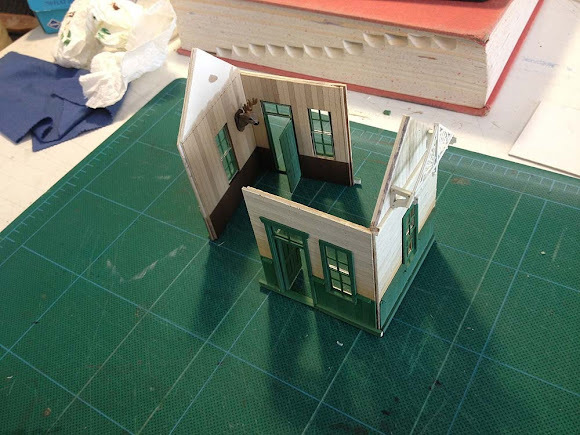 I like loads of detail in my structures, both to give them character and to help tell the story. This last week was spent creating lots of little details for the depot. Platform details. These are mostly resin and white metal castings from various sources, painted with artists acrylics. I use an airbrush to get even coverage and some variations in the color. 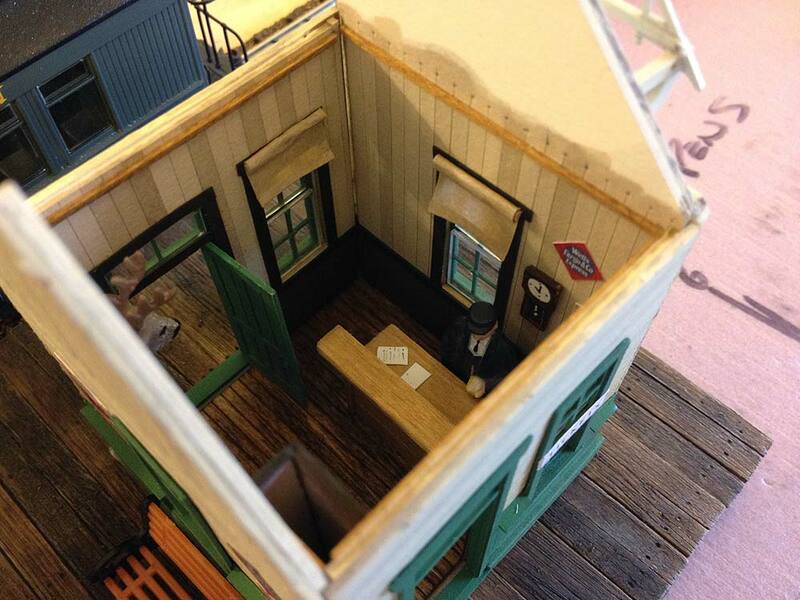 The tinier details were painted with a tiny brush. More platform details. The big trunks are castings from Wiseman. Some of the smaller suitcases were made from bits of strip-wood with music wire handles. 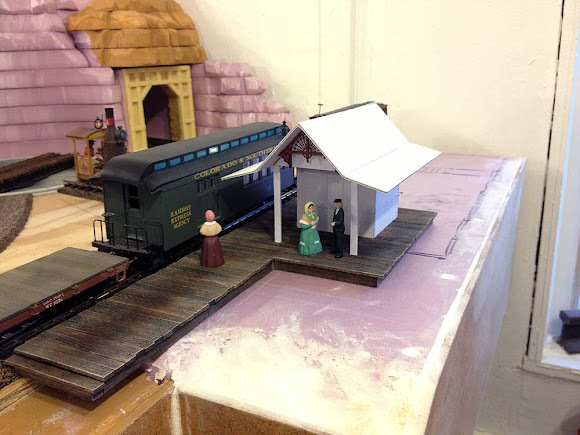 You can paint just about anything with acrylics, but wood, metal and plastic all need to be primed first. This batch of details has just been primed with a rattle-can enamel. 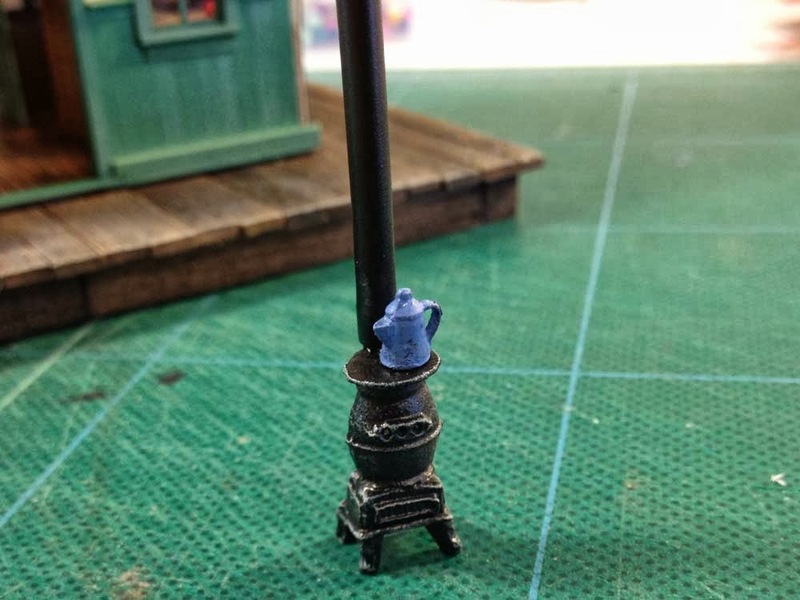 Pot-bellied stove and coffeepot for the depot. Stove and other details installed inside. A broom for sweeping up. Signs and smoke-jack ready to install. 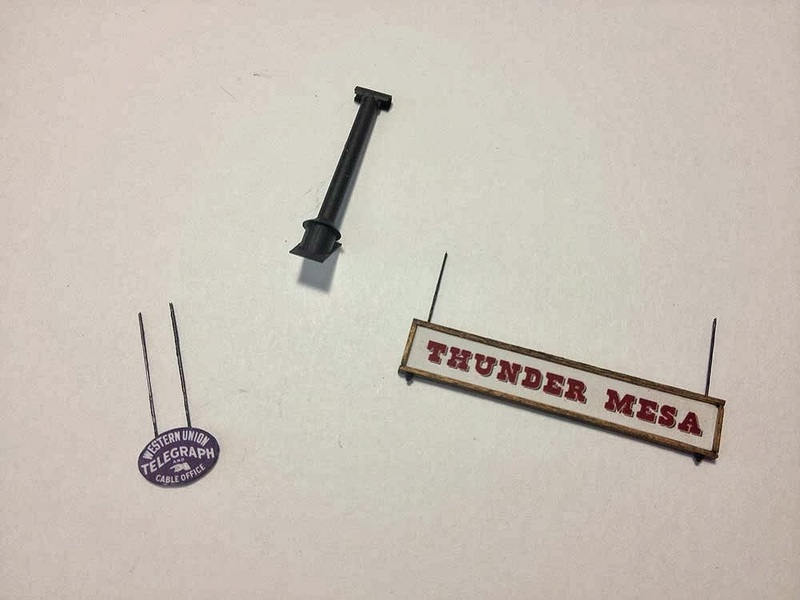 The signs are made from paper, wire and wood. The smoke-jack is from Grandt Line. With a detailed interior like this, it's nice if people can actually see it. 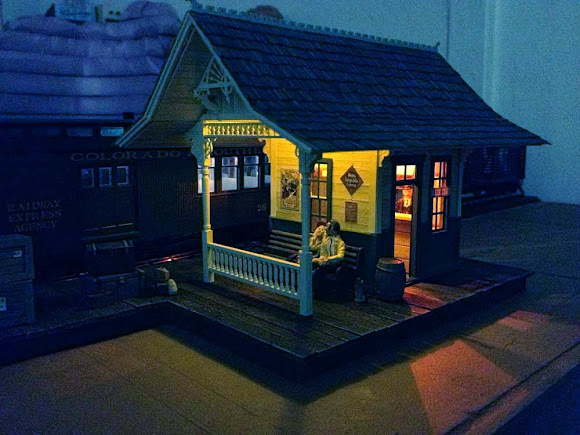 I decided to add LED lighting to the structure, along with some digital telegraph sounds with an ITT Products sound module. LED lighting. One of the bulbs provides a lantern-like flicker. The interior is lit by one 5mm yellow LED and one 5mm flickering LED. The covered waiting area has its own 5mm LED. The yellow bulbs are very diffused at 360º while the flicker bulb is more focused. Wiring for LEDs is pretty straightforward once you figure out that they are polarity specific and every bulb must have its own resistor. The resistors in this case are 510 ohm to match up with a 9 -12v DC power source. The tricky part is soldering all of the tiny components without burning out the LEDs. I tin all of the pieces to be soldered beforehand and use a heat sink (wet paper towel). Tinning with solder beforehand means you only have to touch the components with a hot iron for a second or less to get a good bond. The LEDs provide a nice warm glow. Only one flicker bulb was used because a little flicker goes a long way. 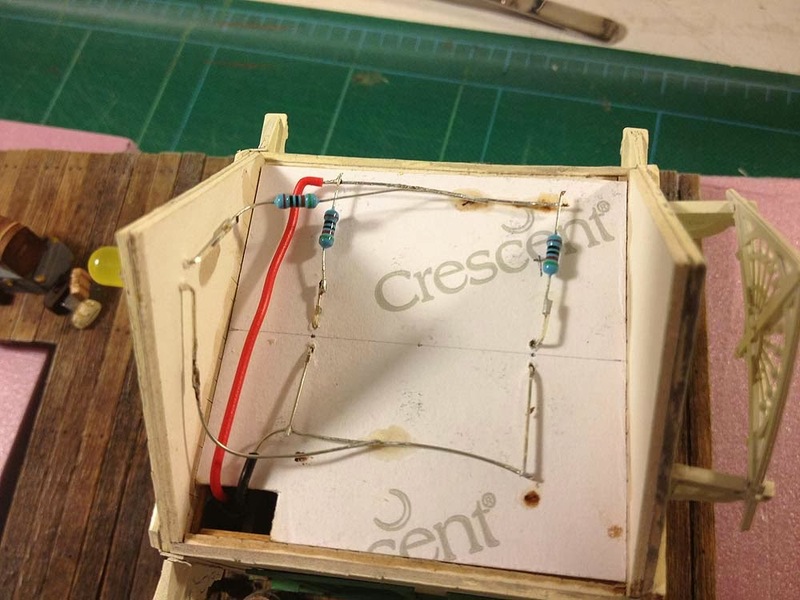 The wires run down through the walls, through the platform, and beneath the layout. 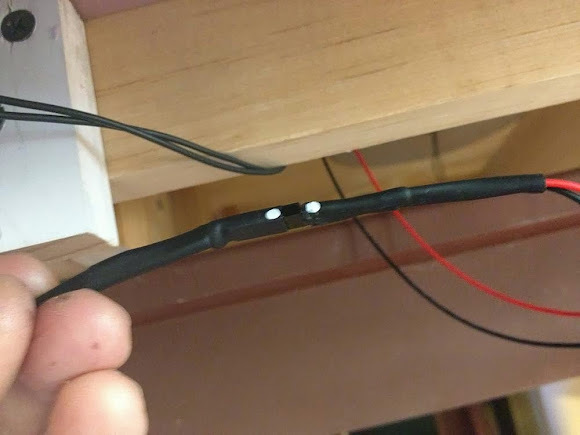 Since LEDs are polarity specific, it was important to keep track of which wire was which - red for positive, black for negative. A mini-plug connector was used to hook up to the effects control panel. 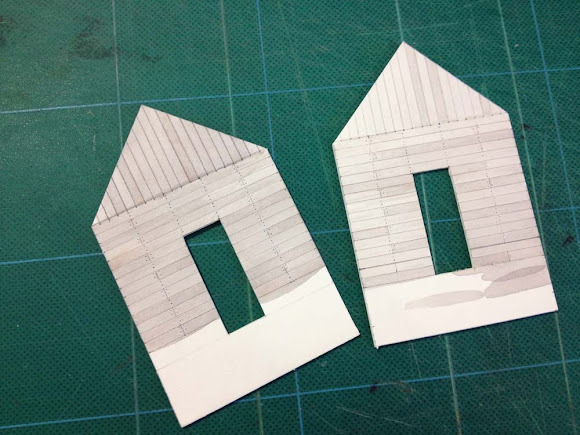 This allows the structure to be easily removed from the layout if necessary. The white dots insure proper polarity alignment. 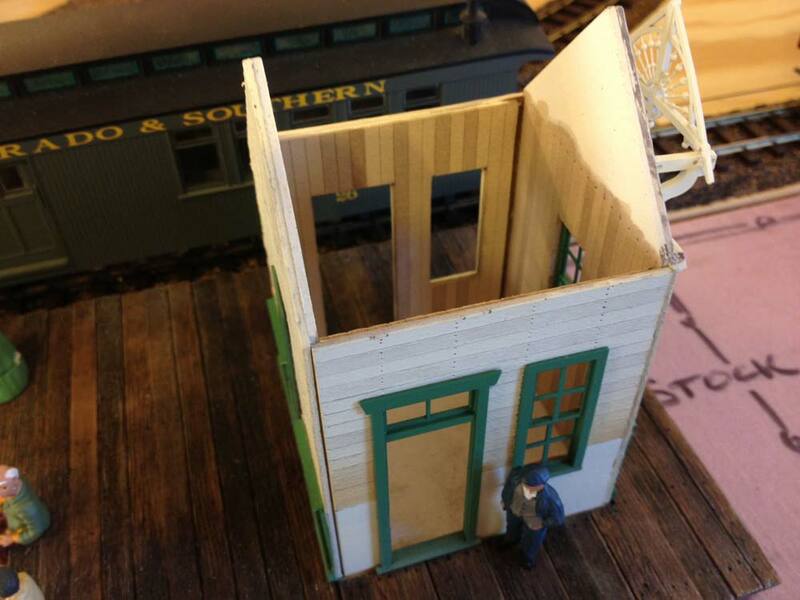 The sound unit is hard-wired beneath the layout and not physically attached to the depot. 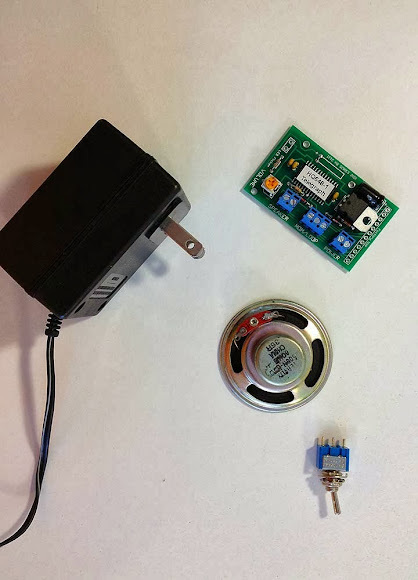 Here are the components of the ITTP sound system, a 9v DC transformer (also used for the lights) the sound module and a 2" speaker. Hook-up was super easy and the sound is great. I can highly recommend ITT Products. The sound module was mounted below the layout with 3M foam tape. It doesn't really matter where this goes, what's important is the placement of the speaker. 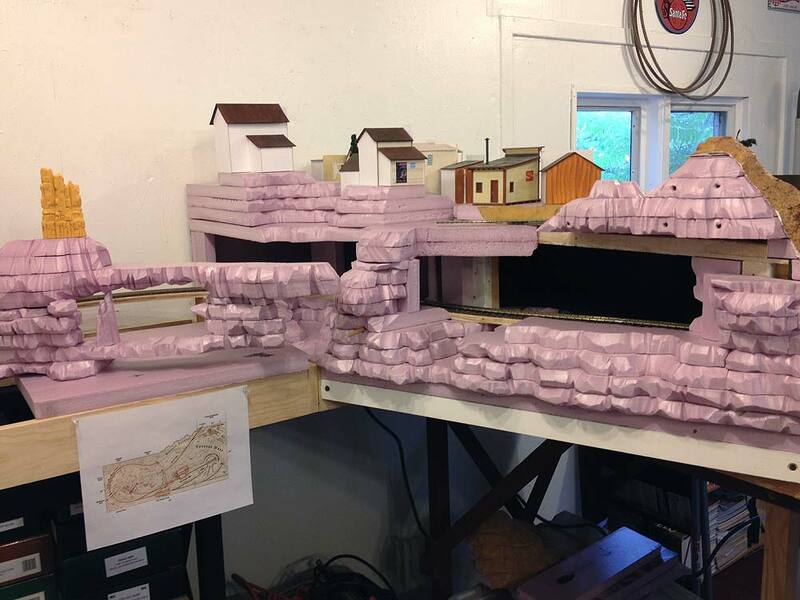 I put mine directly beneath the depot platform (the pink foam makes a great resonator). I had originally planned to cram the speaker in under the roof along with the lighting but there was no need and it actually sounds better where it is. 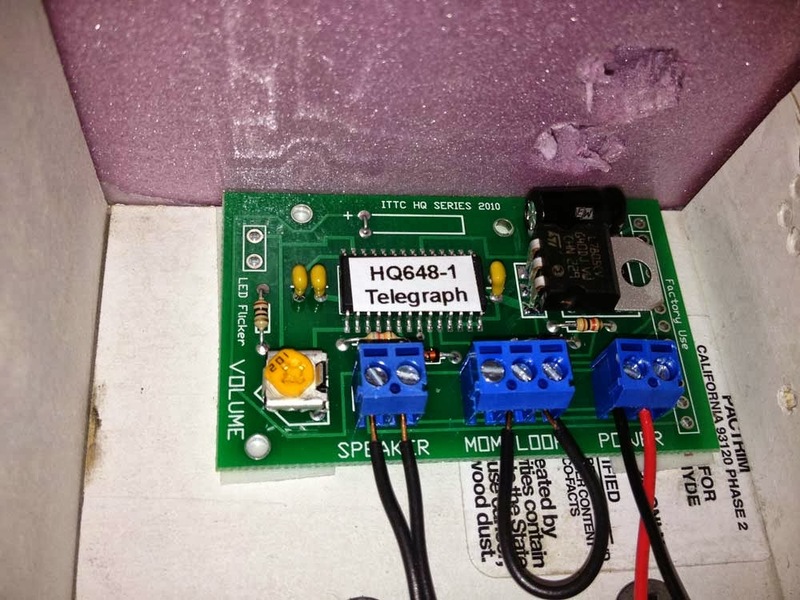 And here is my hi-tech special effects control panel! Actually, the real panel is yet to be built and will control all of the lighting, sound and animation effects in Thunder Mesa. In the meantime, this good old, well used, highly temporary Atlas Connector performs the necessary on/off duties. Okay! I think that covers it for the Thunder Mesa Depot project. It's amazing how much can be packed in to such a small structure. Thanks for stopping in! Here's two more for the road. Nearly all of my hobby time this past week was dedicated to scratch-building a small depot for Thunder Mesa. I described how I built the depot platform in last Monday's post, and today I'll be showing how the building itself was constructed, primarily from illustration board. Thunder Mesa Depot - still not quite finished yet. 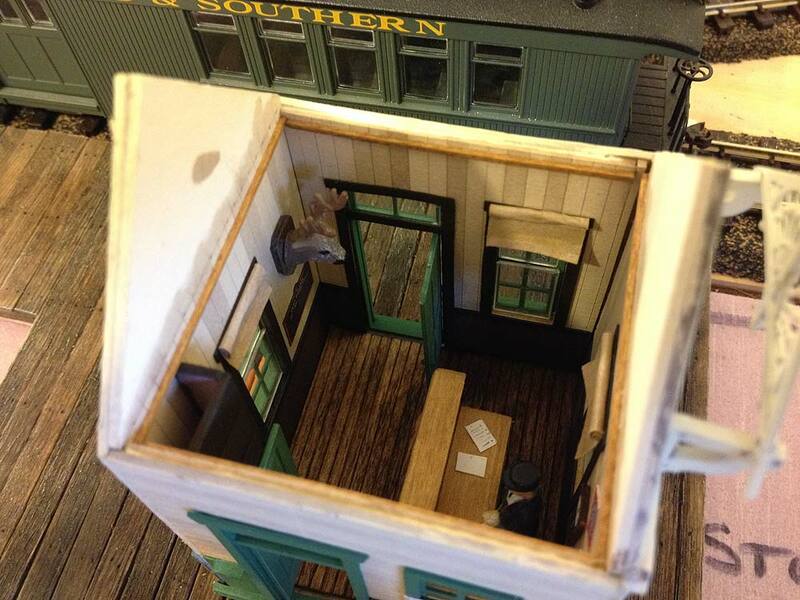 Corner trim, a smoke-jack, platform details, more signs, and a little more light weathering are yet to be added. Also not yet installed are the LEDs for flickering lantern light effects and a digital sound system to provide looping telegraph sounds. The design is freelanced, going for a general look of western "railroad-y-ness," but I also wanted a strong family resemblance to the Frontierland Station at Disneyland (an accurate model of this structure is planned for a later section of the layout). Last year I created a set of plans for the Frontierland Station for an N scale layout. Based on actual park blueprints and historic photos from the 1950s -'60s, the plans are as accurate as I can make them. 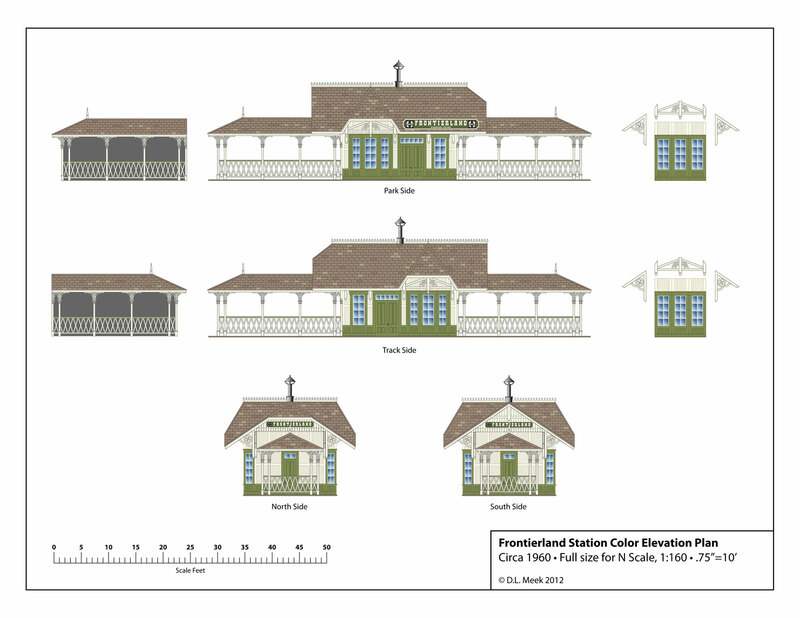 Plans for an N scale Frontierland Station. You can download a free PDF of this plan here. As small as the Frontierland Station is, it's still too big (in O scale) for the location in Thunder Mesa where the depot will be located. 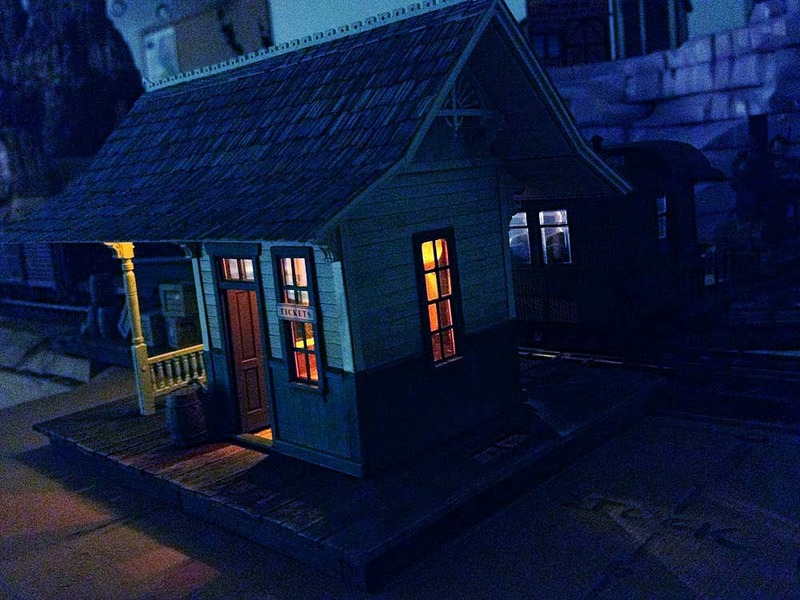 Using strong rooflines, color scheme, and Victorian details, my depot will look like something of a little brother to this one. 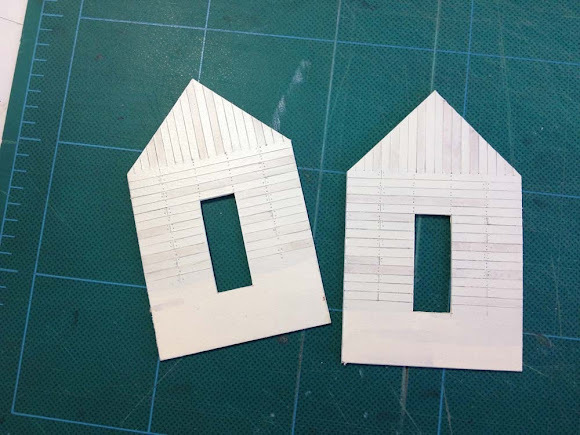 As usual, this structure project began with a paper and card-stock mock-up to test dimensions and clearances. I had a very solid idea in my head of what I wanted so I didn't bother drawing out a full plan. At Disneyland, most buildings are less than full size, and the upper stories are even smaller, using a forced perspective that makes them appear charming and intimate. 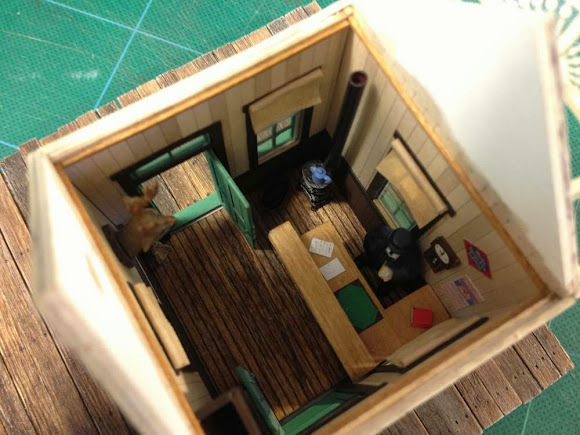 But forced perspective actually works in reverse when looking at a model at or near eye level. Structures will have more charm if they are built small and tall. With that in mind, a scale foot was added to the building's height based on the looks of this mock-up. I chose 16ply Crescent 300 cold-pressed illustration board for this project. It has a lightly textured, off-white surface that can be scribed, painted and detailed to look like a variety of surfaces. 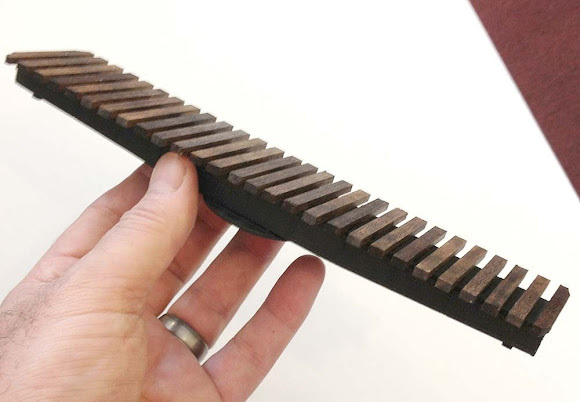 It cuts easily with a hobby knife and results in a more organic looking finished structure than you might get using styrene. 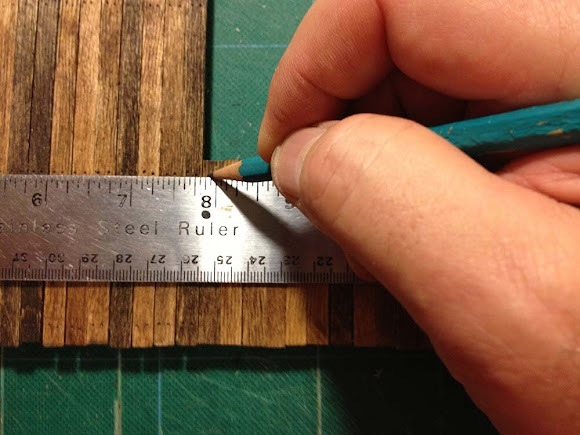 The 1/16" thickness translates to 3 scale inches in O scale. The four walls were laid out on the illustration board in pencil and then cut out with a #11 X-acto knife. 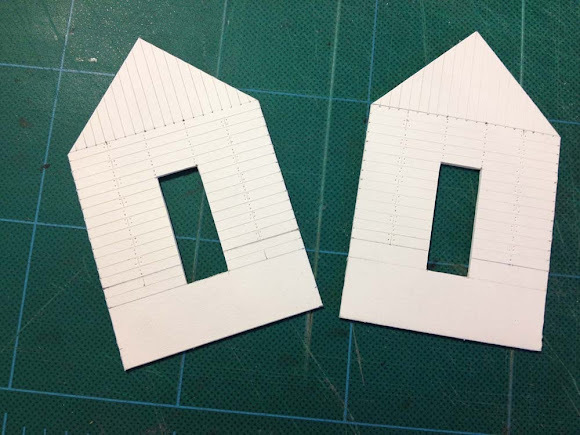 Window and door openings were cut out based on the Grandt Line castings that will be used, and board lines were scribed into the surface of the illustration board. Lastly, nail holes were pressed in using a steal T-pin. A thin, warm grey wash of Burnt Sienna mixed with a few drops of Ultramarine was brushed on to bring out the board and nail hole detail. All paints used on this project are Golden Acrylic Airbrush colors. 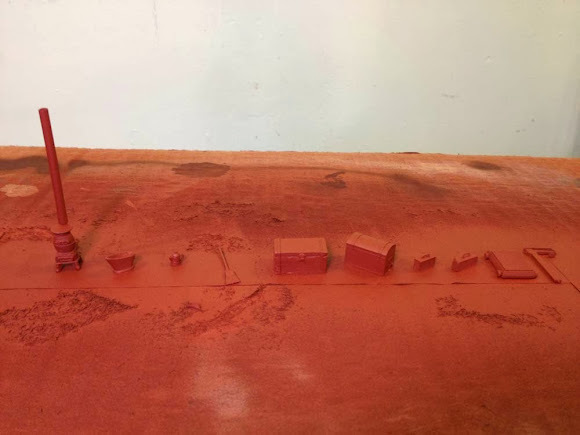 Plastic and styrene parts were primed with a spray enamel primer before final painting. 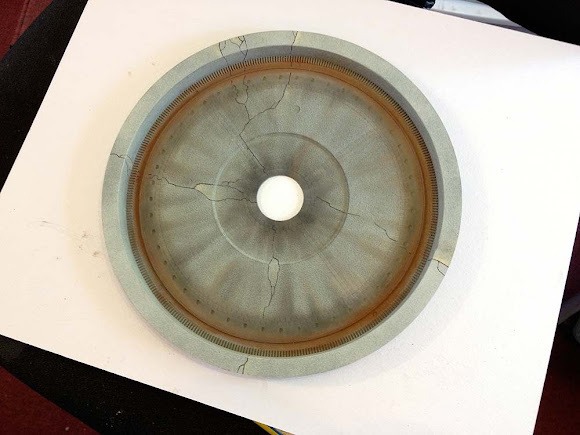 Titanium White was mixed with a few drops of Raw Sienna to make a nice ivory color for the walls and this was applied with an airbrush. Once dry, a few boards were picked out and "aged" with a very light wash of the Burnt Sienna and Ultramarine mixture. Wainscoting and trim was created from Bristol board, painted green, and then laminated to the walls using 3M 45 General Purpose Spray Adhesive. Walls during assembly. 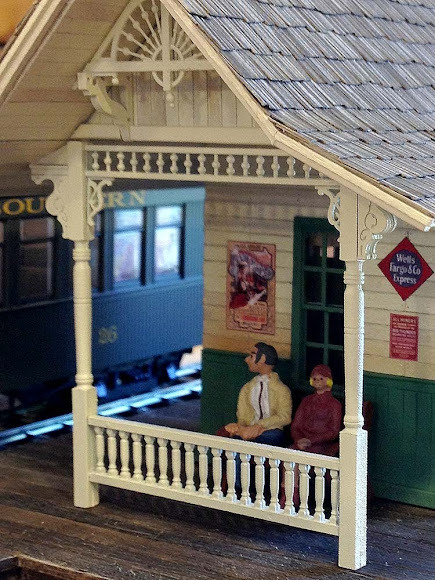 The fancy Victorian roof gable is a Grandt Line casting. The roof pitch was created to match this casting. Interior walls were cut from illustration board, scribed, painted and laminated into place using 3M spray adhesive. 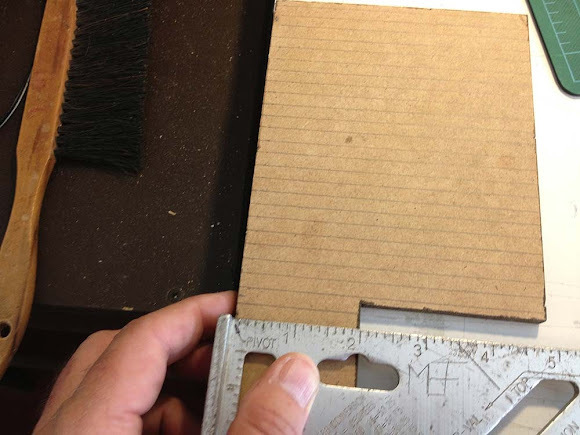 The interior walls are trimmed 1/16" narrower on each side than the exterior walls. This creates an L shaped locking edge when the walls are put together that prevents light leaks and makes for a very sturdy structure. Walls created in this way have equal stress front and back and almost never warp. 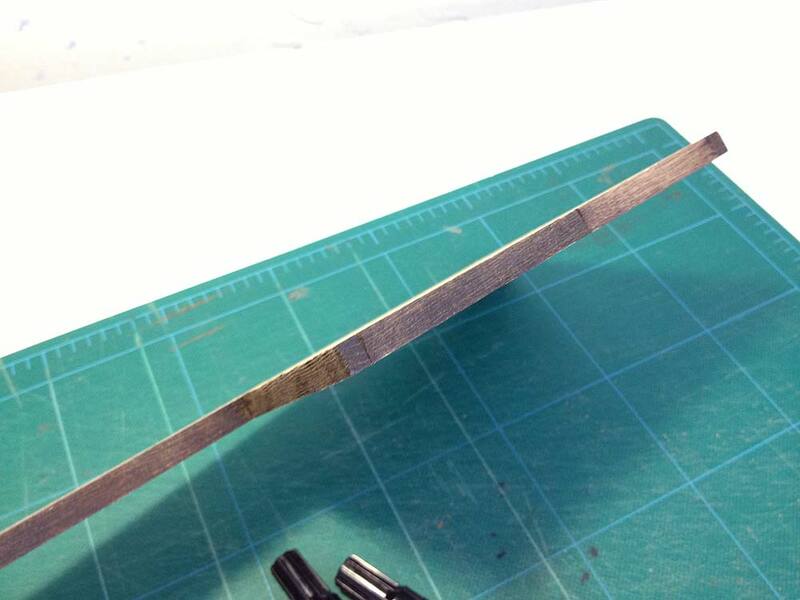 The finished walls are 6" thick in O scale, very close to prototype thickness for a wood frame building like this. Grandt Line door frames and windows were cemented into place using ACC and the windows glazed with clear acrylic. 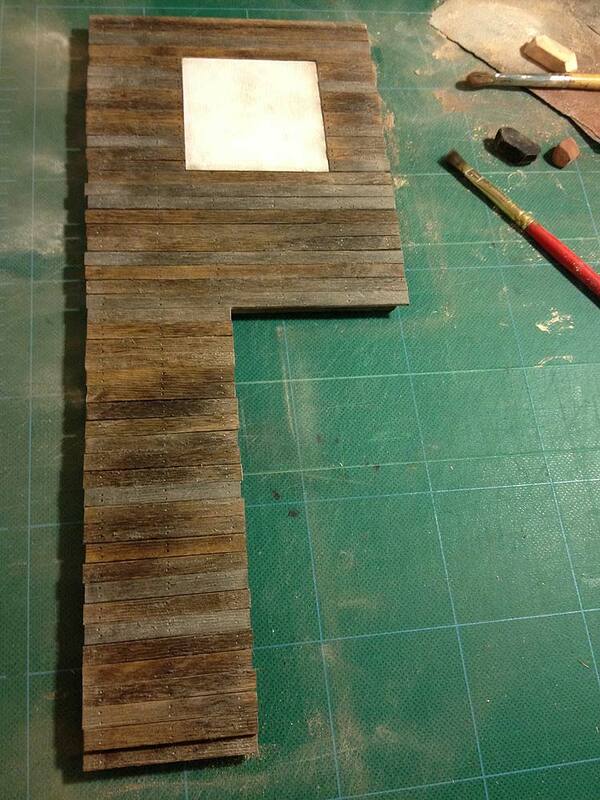 The floor is scribed basswood laminated to illustration board. The walls were cemented together into two separate L shaped sub-assemblies. This makes it easy to visualize the completed structure while still allowing for interior detailing. The detailed interior. The trophy buck is from a Woodland Scenics deer. The window shades are printer paper stained with a Minwax Golden Oak marker. I decided to model the doors open to give a better view of the interior. The wall clock is painted illustration board salvaged from an old model. A potbellied stove is yet to be installed in the lefthand corner. Still in two sub-assemblies. 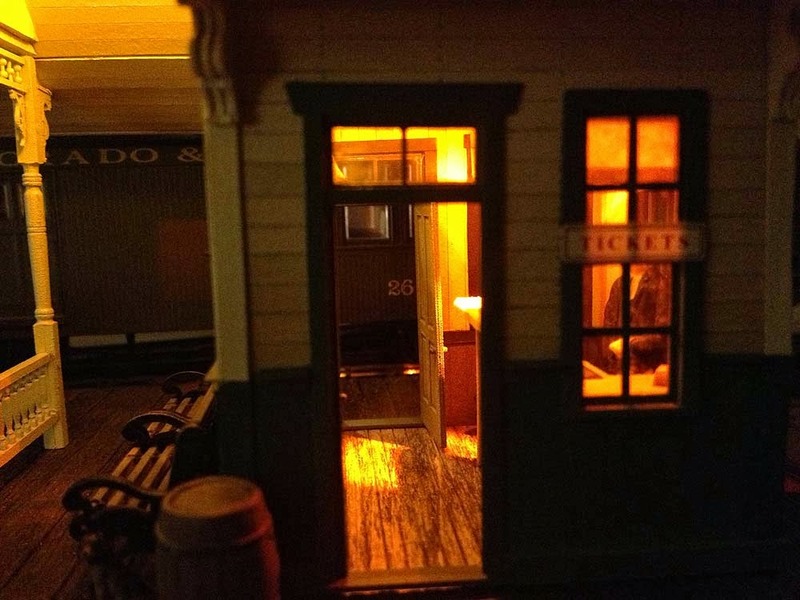 The ticket desk was built from scrap strip-wood and stained with Minwax Golden Oak. The chalkboard timetable is from Main Street Station at Walt Disney World. All of the signs and posters were scaled in Photoshop and printed out on HP Inkjet Presentation Paper. The dark brown "cupboard" at left will be a conduit for the sound and lighting wiring. 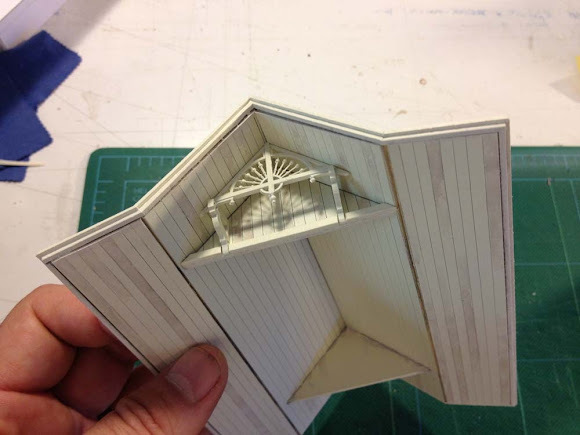 The roof was created in much the same way as the walls, with an inner and outer layer of illustration board painted, scribed and laminated together. Roof end pieces were cut to shape to act as trim and also to hold the shape of the roof during assembly. 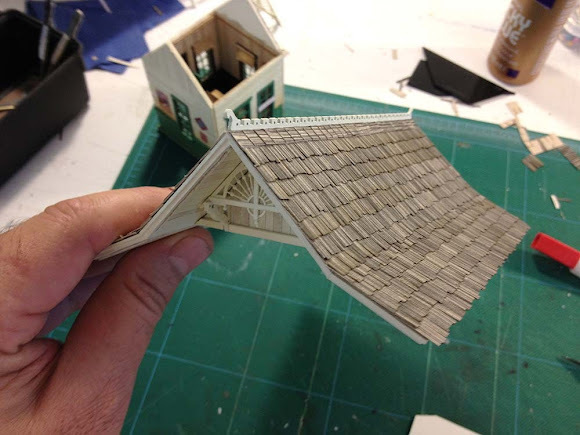 Laser cut paper shingles from Wild West Scale Models were applied using Aleene's Tacky Glue. The ridge-top ginger bread is another Grandt Line casting. The cozy covered waiting area was detailed with porch posts, railing, corbels and spool trim from Grandt Line. Sharp eyed Disney fans might notice a familiar poster left of the window. Okay! 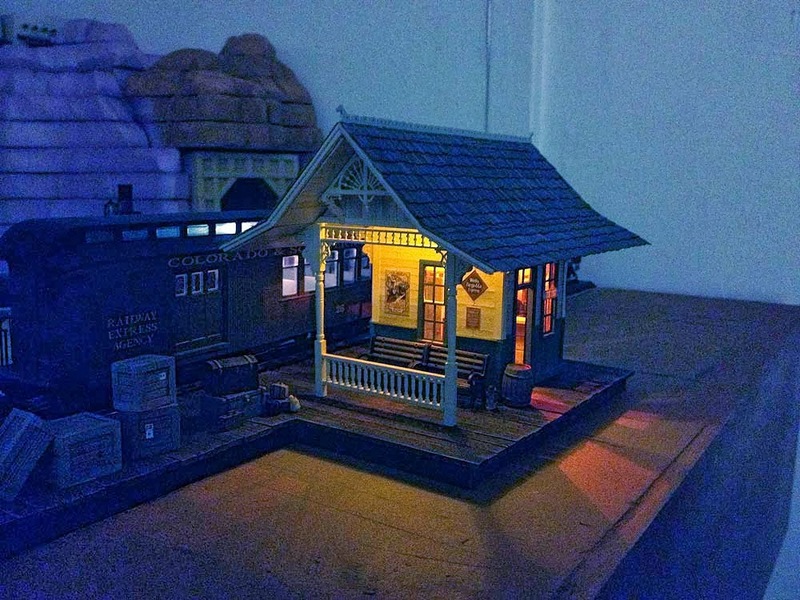 It's been a whirlwind of modeling activity lately and I'm looking forward to finishing the depot in the coming week, adding loads of details, flickering LED lantern light and digital sound. Thanks for stopping in! 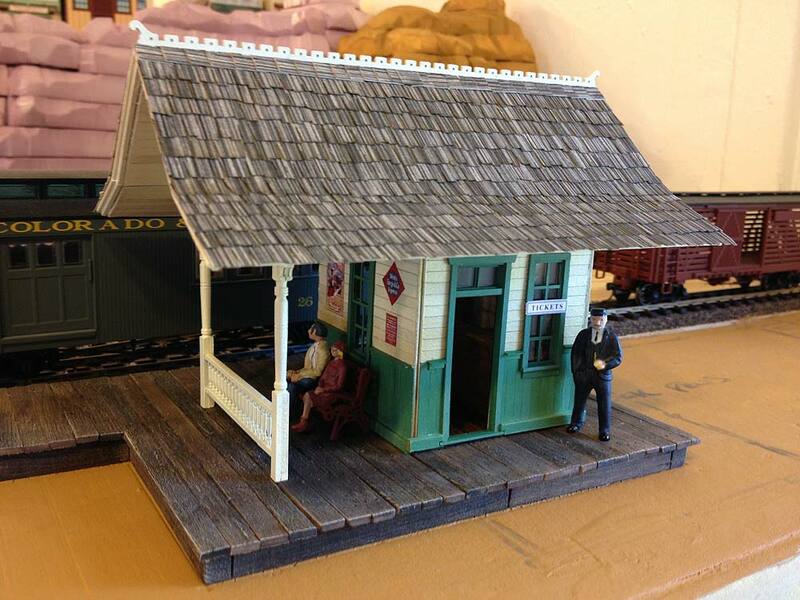 Almost ready for the trains to arrive! A 3'x9' layout with a western mining theme. 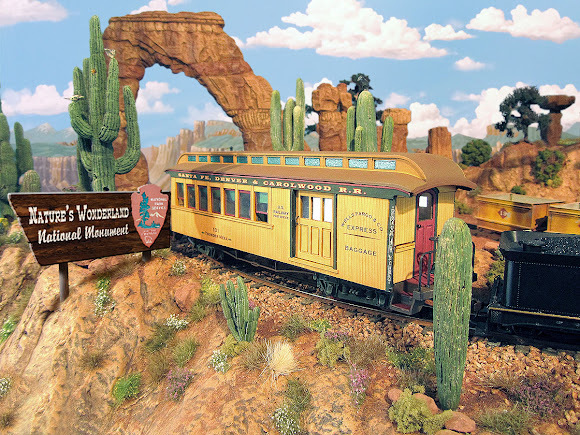 This one is loosely based on the Verde Canyon Railroad near Jerome Arizona. Minimum radius is 12". Track is Atlas code 55. By the way, in spanish, tonto y su dinero means "a fool and his money." A good name for any model railroad in my wife's opinion. One of my favorites. A lot of layout in a small space. 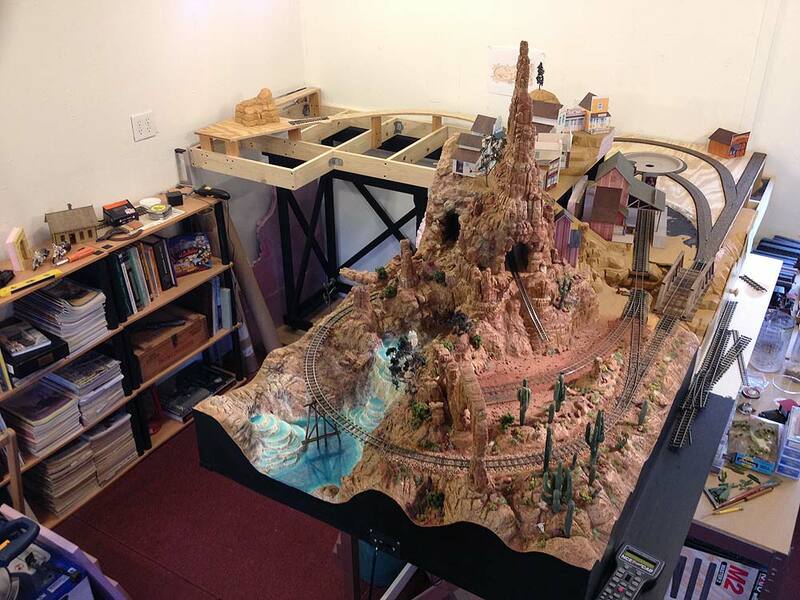 Deep canyons, tall bridges and room for expansion in just 3'x6'. 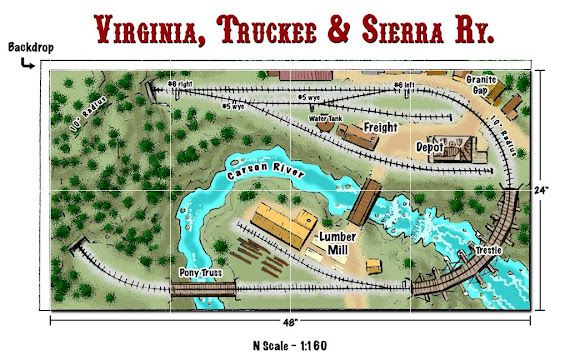 Themed as a mining layout here but might be even better as a logger. Track is Atlas code 55. The hidden track at lower right can connect to staging. Unmarked turnouts are #6s. Small, simple and scenic in just 2'x4'. 10" radius curves, Atlas code 55. I built this one and almost finished it before moving on to other interests. Fun little display layout. Yup, it's an N scale version of John Olson's famed MR project railroad, the Jerome & Southwestern, adapted for a 30" wide hollow core door (HCD). Atlas code 55. Note that I never got around to drawing the bridges, but those are all elevated crossings. This one is an adaptation of the famed Gumstump and Snowshoe switching layout with a little more operating fun built in. Track is Atlas code 80. And last but not least we have the RG&W, based in part on John Allen's original Gorre & Daphetid. I built this one long ago and had a lot of fun with it. 3'x9' with Atlas code 80 as marked. 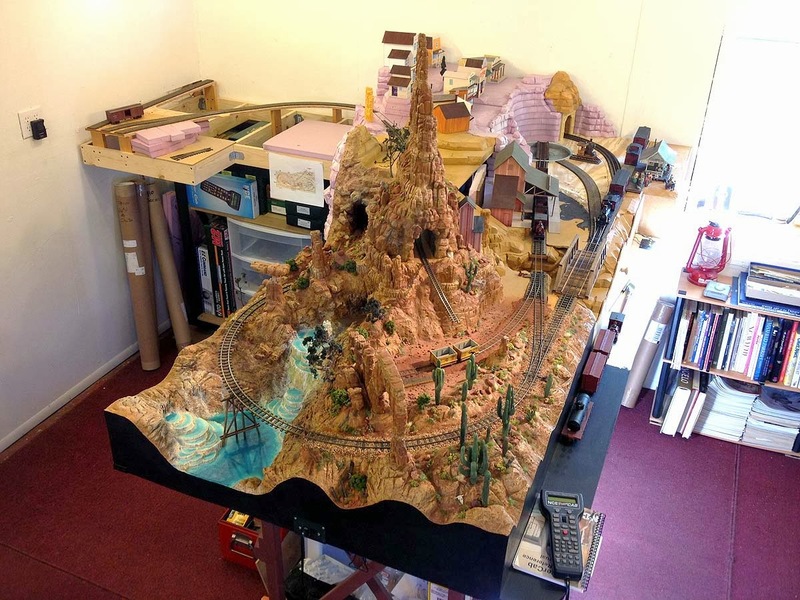 I hope everyone has enjoyed this little side trip into N scale plans and if anyone chooses to build one of them I'd love to see it. I'd be happy to answer any questions in the comments section below. The Pagosa & Southern is just 12" x 72" and uses Kato Unitrack. A train snakes its way through Dinosaur Gap on a moonlit night. My good intentions for posting a new weekly update every Monday were thwarted last week by a total hard-drive melt down. The good news is that all my data was saved and things are now back to normal. 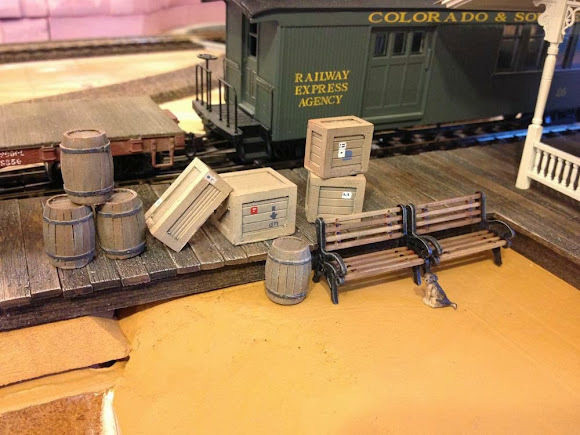 Meanwhile, it's been a busy couple of weeks in Thunder Mesa country with many projects moving along toward completion. 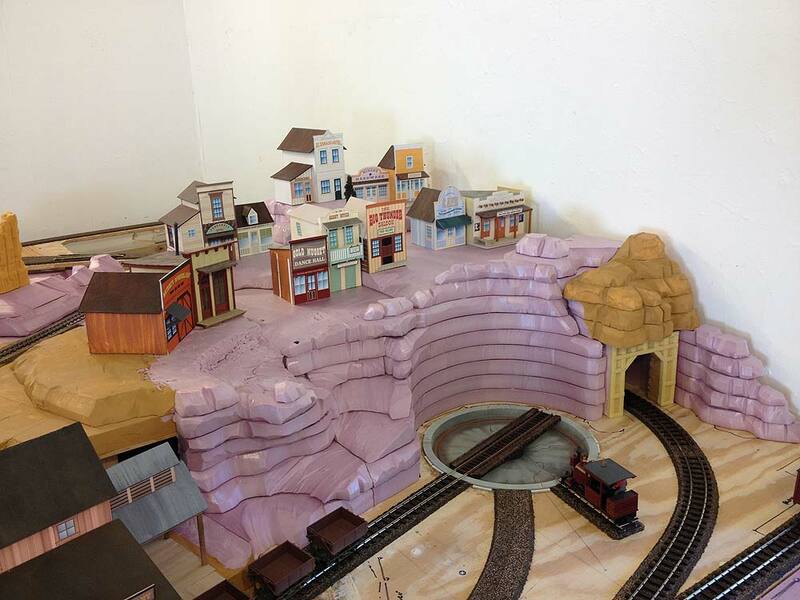 Expansion progress continues, Rainbow Caverns are beginning to take shape, a new turntable has appeared in Thunder Mesa, the town itself has relocated and expanded, and work has begun on a small depot. 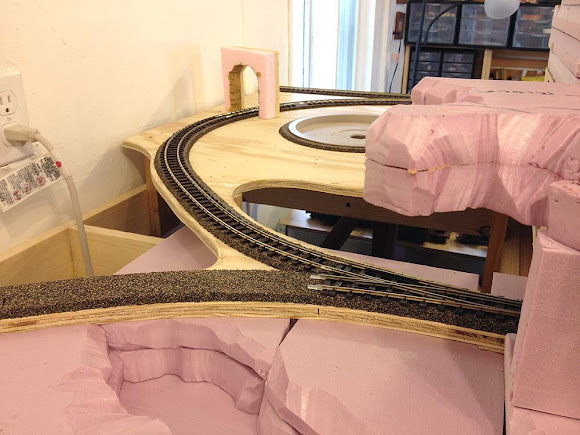 Track has been laid on the new layout sections and I'm finally able to run trains again! Much work is still needed on the Calico corner section but the main loop around and through Thunder Mesa is now complete. 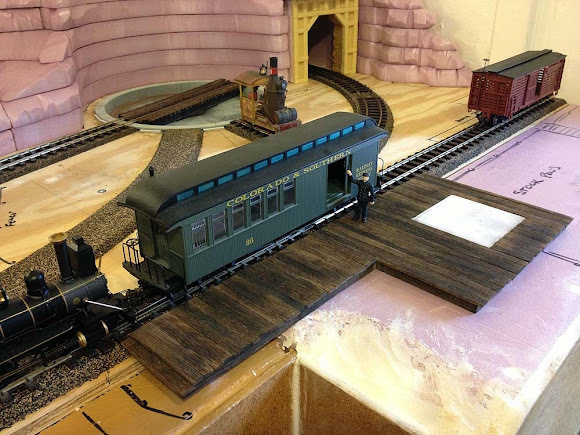 Testing a train on the new loop section. Everything works! 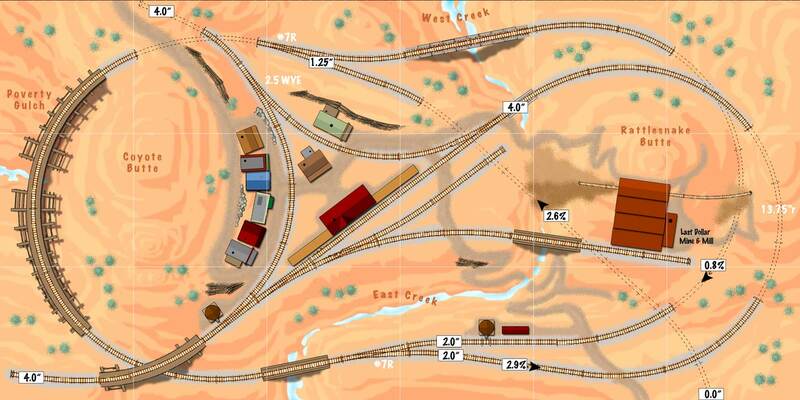 I'm using Peco On30 flex-track and turnouts throughout the layout. It doesn't have the finer scale appearance of Micro Engineering track, but it operates flawlessly. The hidden wye within Rainbow Caverns. 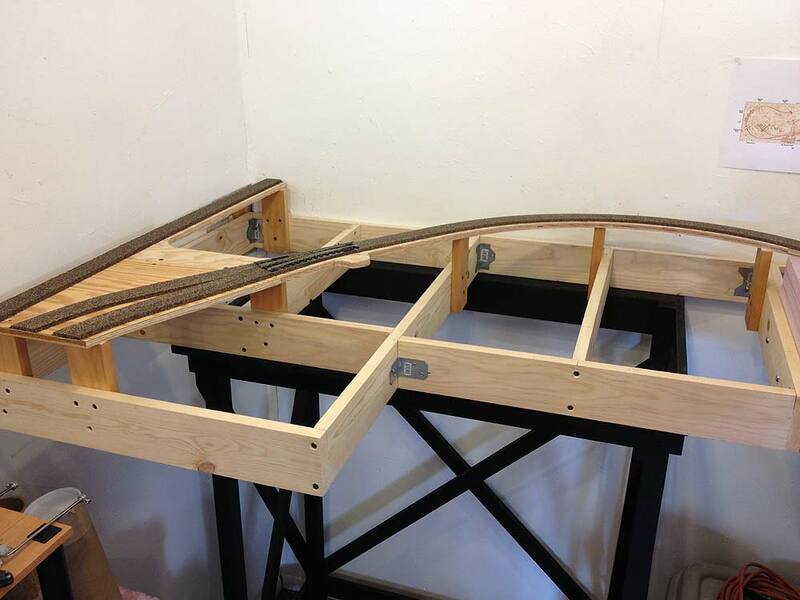 The unfinished foreground track will go to the new Calico section and "points beyond." I lay my track on Midwest HO scale cork roadbed using contact cement and rail spikes here and there as needed. No track yet on the Calico section. I'm having second thoughts about the track arrangement here and how it will lead into the next section. Plans are still up in the air and I might change the route before laying down the track. With the new loop completed I was able to rough in the area that will become Rainbow Caverns. The caverns will be filled with cool lighting and artificial water affects and should become a real focal point of the layout. The trickiest part so far has been planning for and hiding the necessary access to reach trains and track when the need arises. 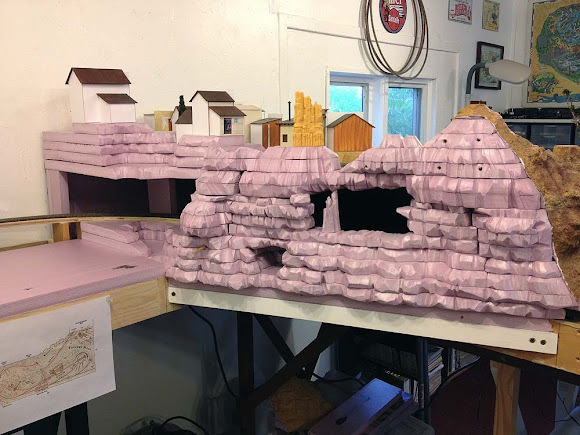 The canyon wall on the backside of Thunder Mesa roughed in with 1" Polystyrene foam. The cave-like openings will be viewing windows into Rainbow Caverns. The pink foam is carved to shape with a hot wire cutter. Closer look at the cave opening. Not much to see here yet. The interior has been painted flat black. A large piece of the cliff-face is removable to provide access to the Caverns. The removable section is at left. 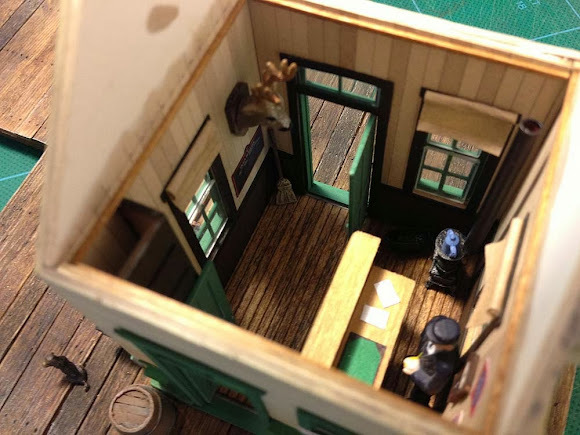 Most of the town now also sits atop a removable foam access hatch. 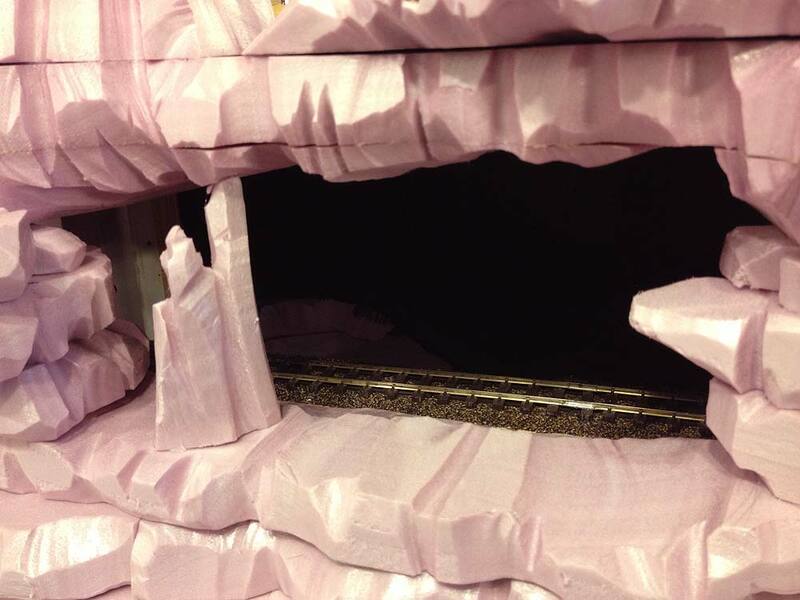 The Caverns will are being built as a series of shadow-box like vignettes that the trains will pass through. 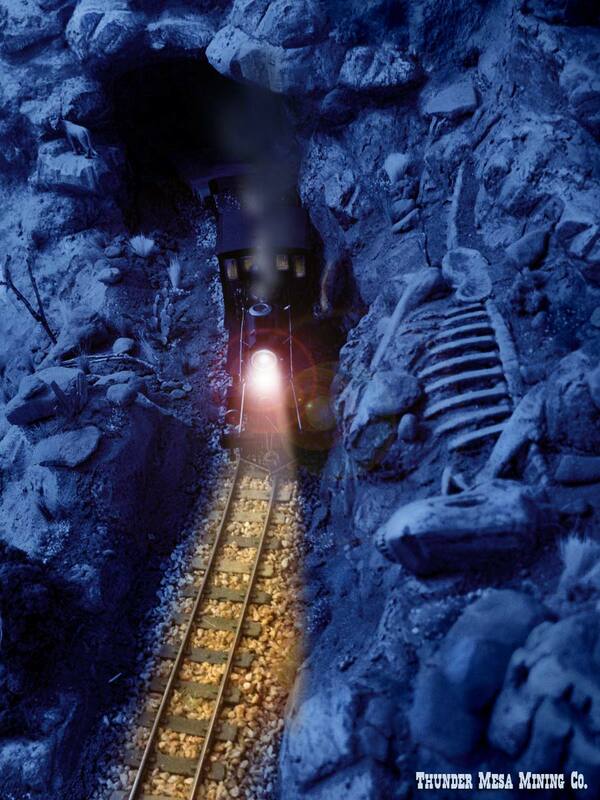 The first two scenes will be reminiscent of great limestone caverns like Carlsbad or Mammoth Cave, and the third will be a major underground mining scene like the famous "Glory Hole" on Knott's Calico Mine Ride. 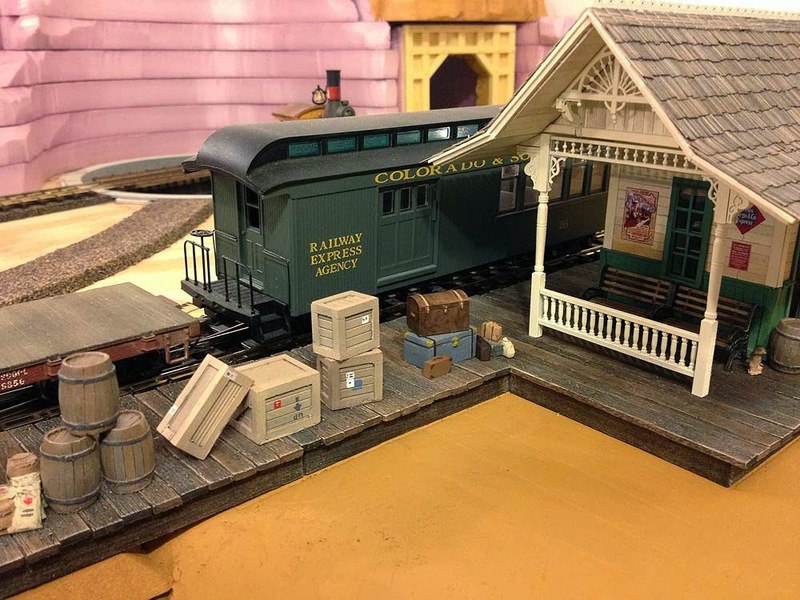 The mine scene will tie into the On18 Calico Gold Mine Diorama to be built above the new Calico section. 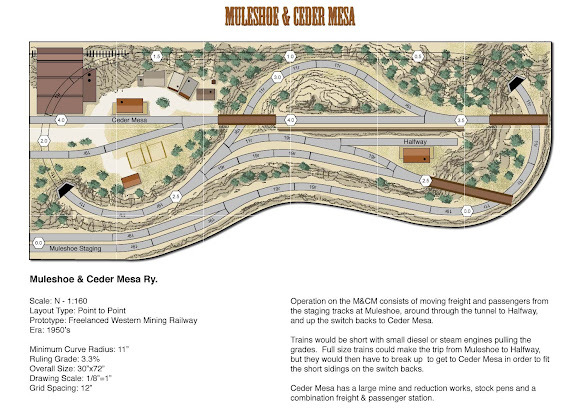 The new track plan calls for a 36' turntable at Thunder Mesa. This will be vital to operations as it not only provides a way to turn trains, but also acts as a switch, enabling the locomotive to run around its train. 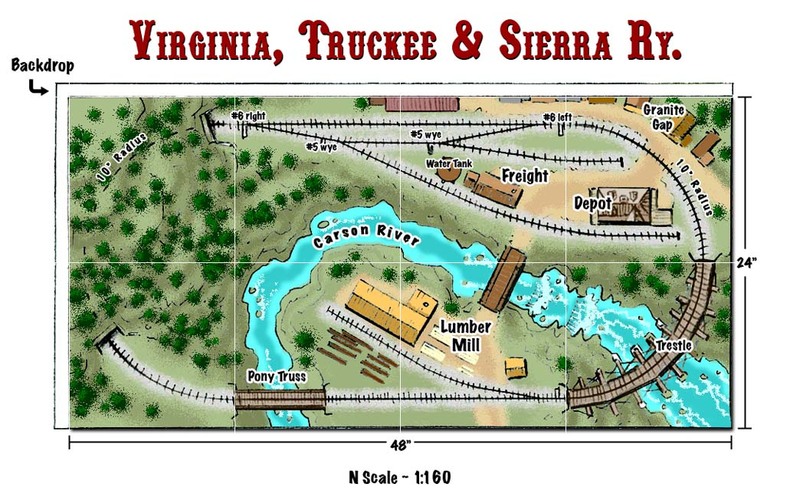 I first saw this type of track arrangement on John Allen's HOn3 Devil's Gulch and Hellengone and always though it a perfect solution for a narrow gauge railroad built in a tight space. 36' turntable at Thunder Mesa. Note the timber cribbing retaining wall around the back of the TT. I started with a Walther's 120' N scale manual turntable. Sorry to say I cannot really recommend this kit. The castings are very rough and covered with flash and the instructions are a joke. 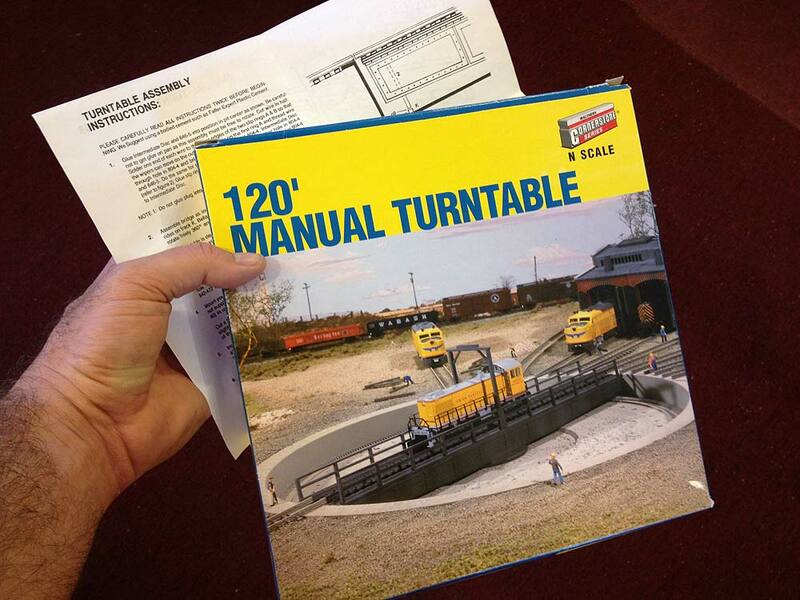 I used it because the pit is the right size and I had it lying around from my old N scale days. Once the pit is painted and weathered it doesn't look too bad. I painted it with Krylon flat Grey Primer and a light overspray of Krylon light tan for a nice concrete color. The pit rails was painted with rust colored acrylics and the weathering is done with colored chalks. I drew "cracks" into the concrete with a hard lead pencil and then punched them up here and there with a fine point Sharpie. 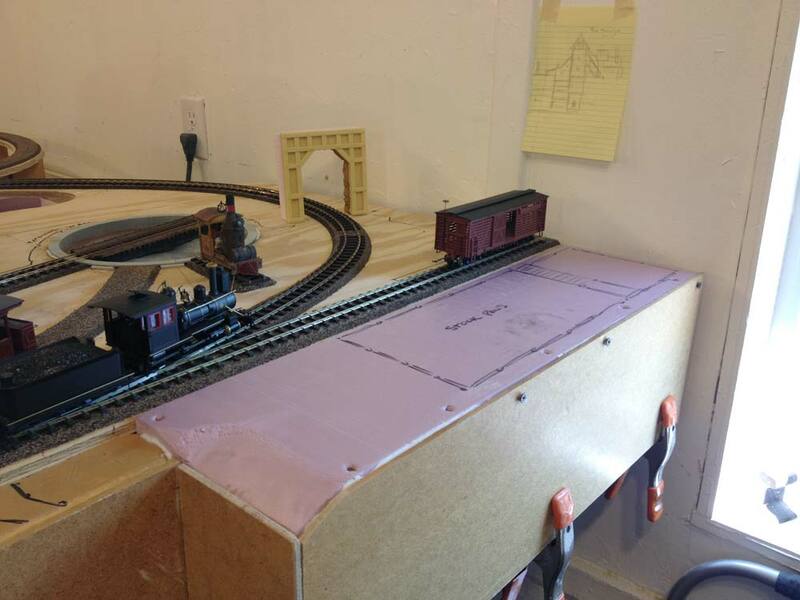 I built an On30 bridge on top of the N scale girders using scale 6"x8"x8' ties stained with a combination of Minwax Dark Walnut and Early American. I use the Minwax touch-up stain pens to stain most of my wood. 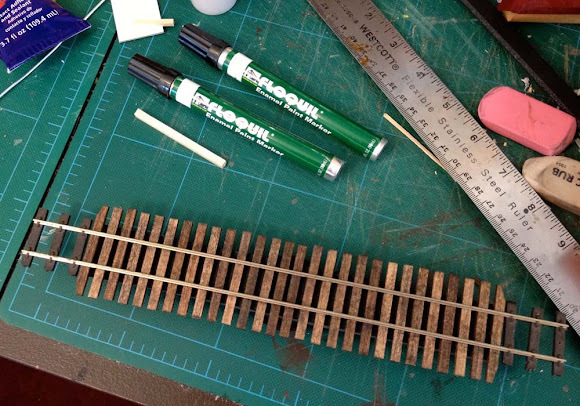 I laid out the rails using a length of Peco On30 flex-track - keeping a few ties on at each end helps to keep thing in gauge. The rail was then spiked down with medium rail spikes from Micro Mark; a good match for the cast in spike detail on Peco track. The rails were painted using Floquil paint markers Rail Brown and Rust. Feeder wires were also soldered to the underside of each rail at this time. 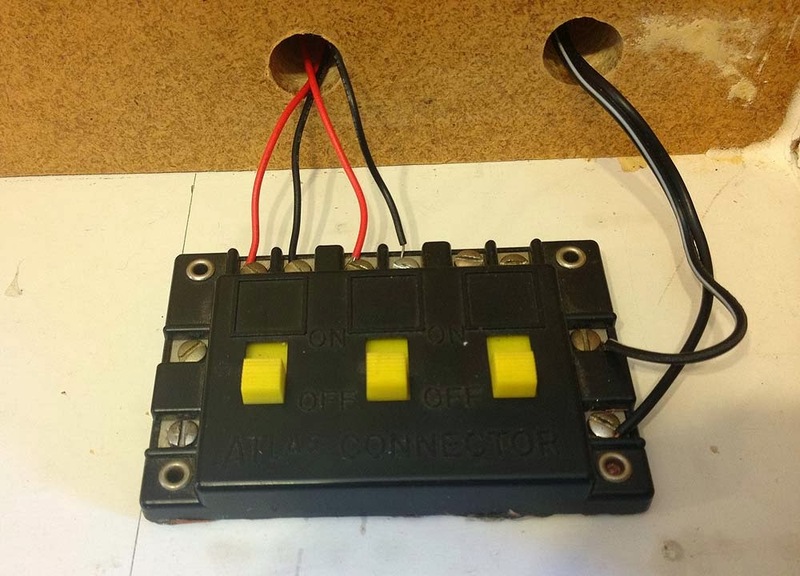 The wires extend through the center of the bridge and will connect to a DCC auto reversing unite below the layout. The rails were trimmed to length and aligned with the approach track on the layout before final spiking. Scale 6"x6" guard timbers were added along the ends of ties along with 1"x12" catwalks on each side. 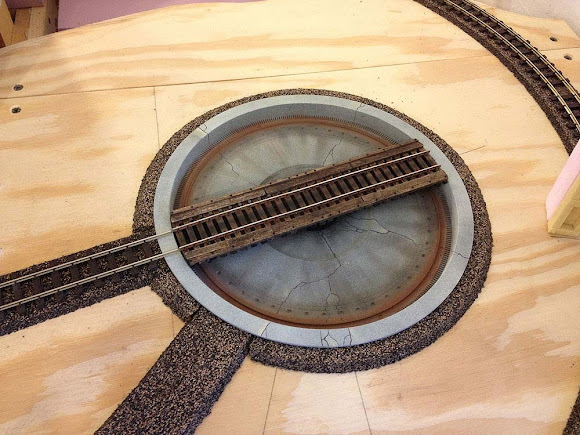 Grandt Line nut, bolt, washer castings finish the bridge. 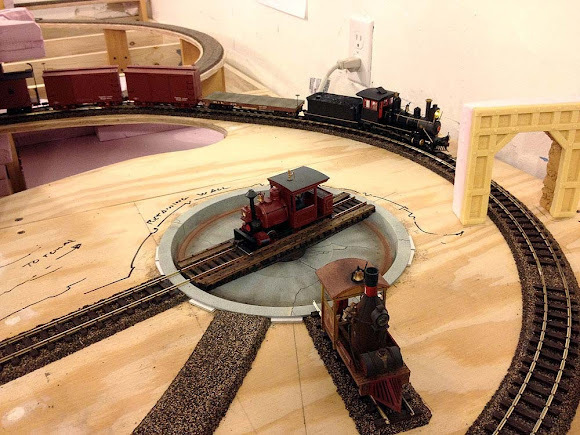 Finally, the turntable was leveled and shimmed to meet up perfectly with the approach track. Just waiting on delivery of an MRC auto-reversing unit to complete the wiring. The turntable is not motored but I'm engineering a simple gear assembly to manually turn it from the layout fascia. 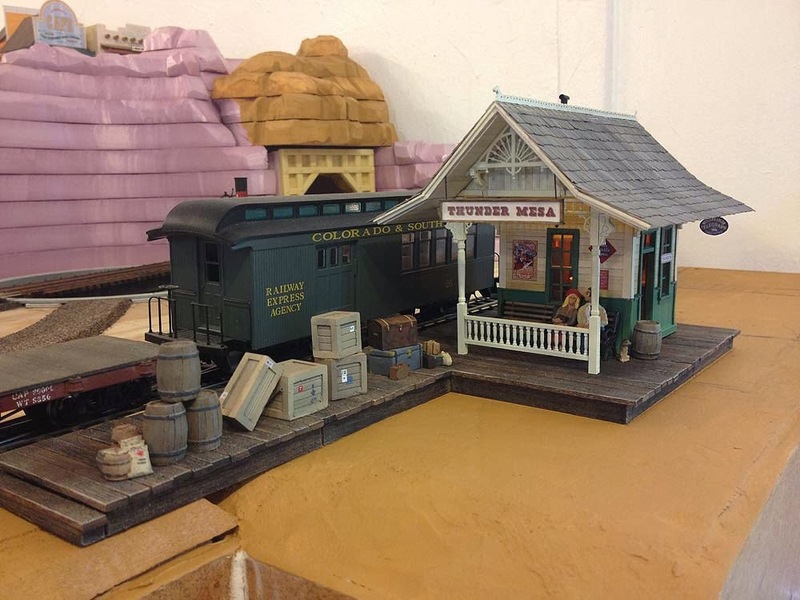 Once I started roughing in the scenery around the turntable area it became apparent that there would be much more room for the little mining town than there had been when it was squeezed in behind and above the Big Thunder Mill. The original plan for this area called for a mine of some kind, but that will now be located more logically closer to the mill, while the town will be more fully fleshed out and expanded in the area above the tunnel. 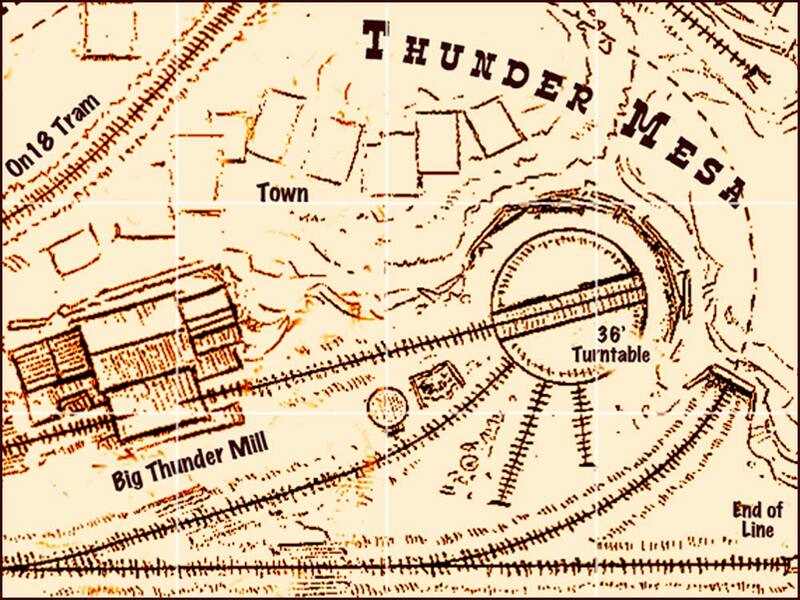 The little mining town of Thunder Mesa. 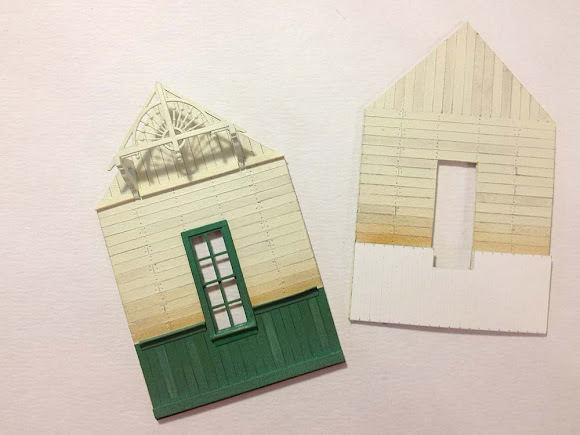 Most of the buildings here are temporary paper-models based on the original Rainbow Ridge structures at Big Thunder Mountain in Disneyland. 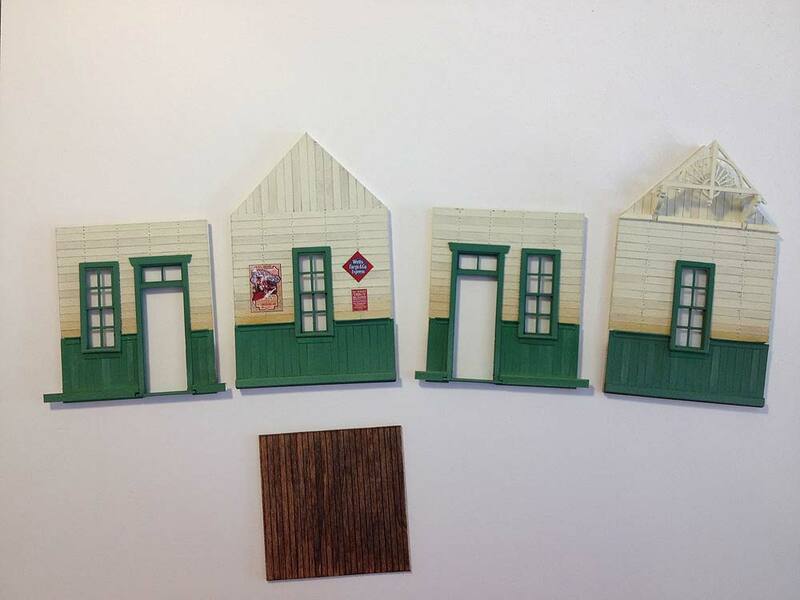 These quick and easy mock-ups are very helpful when layout out a scene like this. The amphitheater looking area behind the turntable will be detailed with rock-work and timber-cribbing retaining walls. This was a neat detail on Malcolm Furlow's HOn3 Denver & Rio Chama Western that I always really liked and wanted to emulate. To the left of the turntable will be a steep, switchbacking road up to the mesa top. 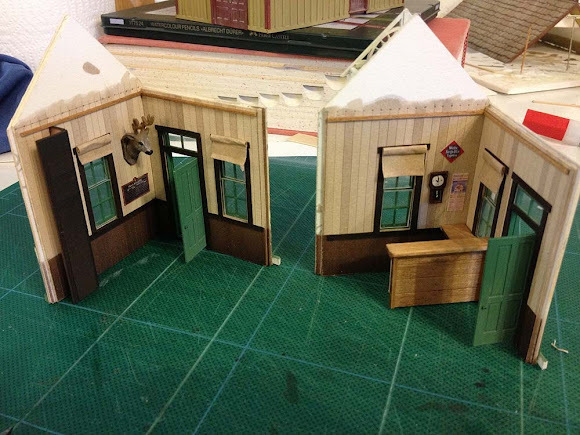 The first step was to create some new real estate for the depot along the layout's front edge. This 24"x7" bump-out is the same width as the existing "coffee-shelf" and so adds nothing to the overall footprint of the layout. Some stock pens are also planned for next to the depot. 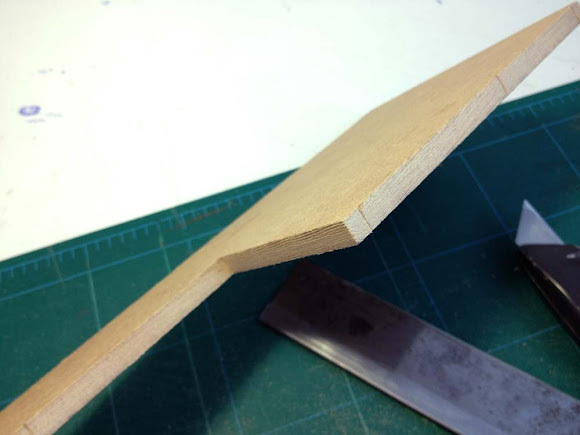 I want a strong a durable base for my structure so I'm using 1/4" MDF. 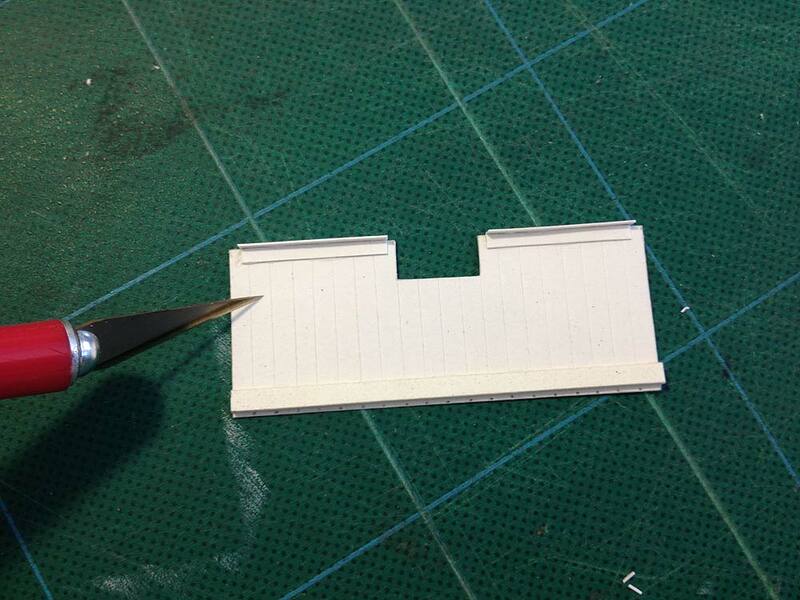 Here is is cut to the basic shape of the platform. 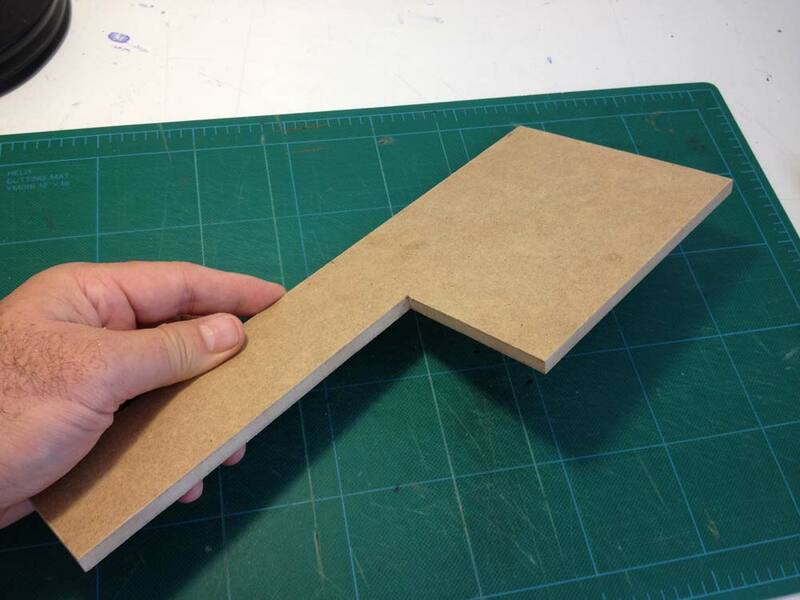 The 1/4" thickness of the MDF is perfect for simulating the look of scale 12"x12" timbers. I dragged the blade of a razor saw along the edges to simulate woodgrain and used a utility knife to carve lines, simulating the ends of 12' long timbers. Once stained with Minwax Dark Walnut and Early American, the MDF is very difficult to tell from dimensional strip-wood. 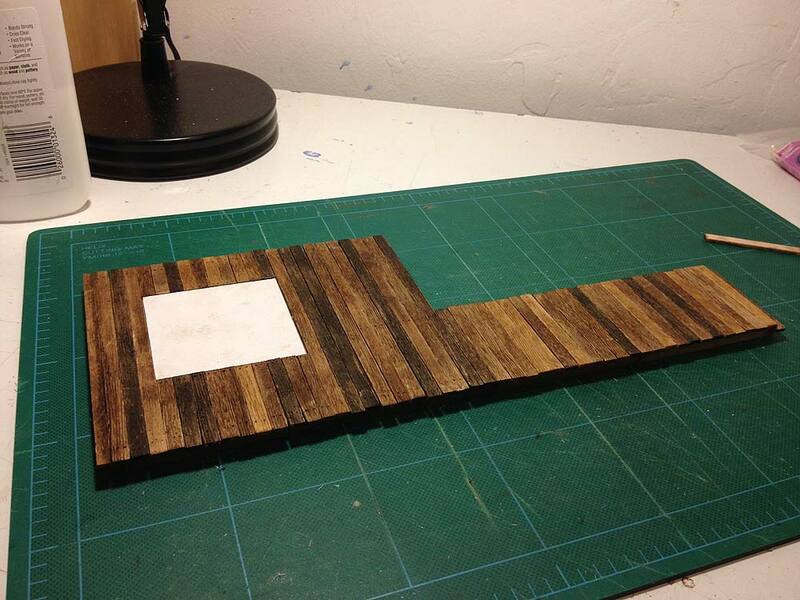 Laying out lines every 1/4" for the scale 1"x12" decking. This will help keep things straight. The decking in place. The white square is a piece of illustration board glued to the MDF for the ticket office footprint. The actual floor will be built on top of this. I used a hard 5H pencil to press nail holes into the decking. Weathering done with colored chalks. This would be harder to do once the structure is attached. Checking the fit on the layout. 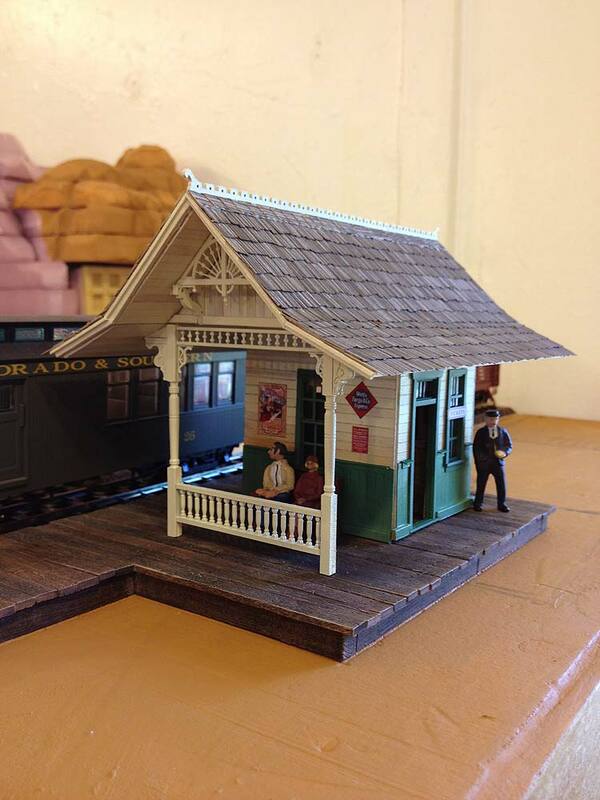 Here's a preview of the depot itself. I laid out the basic shape and built a card-stock mock-up to test clearances etc. This will act as my plan for building the actual structure.